The small intestine of our digestive tract begins after the stomach, and is subdivided into three distinct parts: duodenum, jejunum, and ileum. The duodenum is the first part of the small intestine. It is continuous with the terminal part of the stomach at the proximal end and with the jejunum at the distal end. Like any part of the body, the duodenum can become inflamed and painful. The duodenum is a C-shaped tube that is approximately 12 inches in length. The partially digested food from the stomach, and the digestive juices from the pancreas and the gallbladder empty into the duodenum. Since the duodenum receives the acidic gastric contents as well as strong digestive juices, it is constantly at risk of getting injured and inflamed. Inflammation of the duodenum is referred to as duodenitis. Duodenitis refers to an inflammation of the duodenum. It is frequently associated with gastritis (inflammation of the stomach), and occurs as a consequence of repeated irritation of the mucosal lining inside the duodenum. Duodenitis may also lead to the formation of open sores or ulcers in the duodenal wall. All of these conditions may cause pain along with a host of other symptoms like changes in appetite, nausea and bloating. Under normal circumstances, the duodenum has many defense mechanisms against the highly acidic stomach contents. A large amount of mucus that coats the walls of the duodenum prevents stomach acid and digestive enzymes from destroying the duodenal wall. In addition, water and alkaline secretions from the gallbladder and the pancreas help to dilute and neutralize the stomach acid. Furthermore, the inner lining of the duodenum heals from any injuries rapidly and regenerates the injured areas quickly. Duodenitis occurs when these compensatory mechanisms are compromised. Duodenitis can be categorized according to different characteristics, such as duration, severity and location. Acute vs. chronic duodenitis: Acute duodenitis arises abruptly and persists only for a short duration. However, severe symptoms are common during this condition. On the other hand, chronic duodenitis persists for many months and years, and yet remains asymptomatic for long stretches of time. Periodically, short episodes of severe symptoms occur. Erosive vs. non-erosive duodenitis: Erosive duodenitis causes erosion of the inflamed duodenal walls, resulting in formation of open ulcers. Non-erosive duodenitis does not result in ulcer formation. However, inflammation is still present. Bulbar vs. post-bulbar duodenitis: The first part of the duodenum that lies adjacent to the pylorus of the stomach is known as the duodenal bulb. When inflammation occurs in the duodenal bulb, the condition is referred to as bulbar duodenitis. When inflammation occurs in the rest of the duodenum, the condition is referred to as post-bulbar duodenitis. Bulbar duodenitis is more frequent than post-bulbar duodenitis. Gnawing ache or a severe burning pain in the upper, middle region of the abdomen. Abdominal pain worsens upon eating. Sensation of fullness in the abdomen (bloating). Hematemesis or presence of blood in the vomitus (in case of bleeding duodenal ulcers). Loss of appetite and unintentional weight loss. Melena or expulsion of dark, tarry stools. Apart from noting the clinical signs and symptoms, a doctor will also perform endoscopy of the upper gastrointestinal tract in order to confirm the diagnosis of duodenitis. Read more on upper middle abdominal pain. Duodenitis can be caused by any factor that increases gastric acid secretion, irritates duodenal lining, and compromises the protective barriers of the duodenum. Many of the factors that cause gastritis are also responsible for causing duodenitis. Two of the most common causes of both gastritis and duodenitis are infection with the Helicobacter pylori bacteria and excessive usage of non-steroidal anti-inflammatory drugs (commonly abbreviated as NSAIDs). A host of factors may also contribute to the worsening of the symptoms of duodenitis. Examples of such factors include alcohol, cocaine, stress, tobacco, corticosteroids, autoimmune disorders, radiation, inflammatory bowel disease, pernicious anemia and giardiasis. Antibiotics: Antibiotics are used to treat infections that cause or worsen duodenitis (such as Helicobacter pylori infection and giardiasis). Eradication of H. pylori infection may require more than one course of treatment with multiple antibiotics. Acid-suppressing drugs: Gastric acid production or secretion is reduced by drugs such as proton pump inhibitors and H2-blockers. Bismuth-based drugs: Bismuth-based drugs are used to coat the internal walls of the duodenum and reduce inflammation. In addition to drugs, dietary changes also help in the management of duodenitis. Foods and beverages that cause or exacerbate duodenal inflammation should be avoided. Foods to avoid include fatty foods, spicy foods, alcoholic beverages, caffeine, and preservative-laced processed foods. Avoiding cigarette smoking is also beneficial in the management of this condition. Pain arising from the duodenum is felt as upper abdominal pain. However, it is difficult to diagnose based solely on the location of the pain because abdominal pain is a vague symptom. A variety of organs lie near the duodenum, and ascribing abdominal pain to a specific part of the intestine can be difficult. Since the duodenum is a key part of the digestive system, pain in the duodenum is likely to be accompanied by other digestive symptoms. 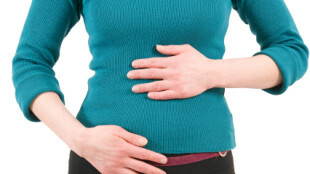 Abdominal pain worsens after eating. Bloating feeling even after taking a few morsels of food. Duodenitis and duodenal ulcers: Inflammation of the duodenum often causes duodenal pain. Duodenal ulcers cause pain after coming in contact with food and acid. Duodenal cancers: Duodenal cancers are uncommon and may not cause any symptoms at the beginning. These cancers may either arise within the duodenum or metastasize from elsewhere in the body. Small intestine bacterial overgrowth: The majority of intestinal bacteria reside within the large intestine. Conditions such as AIDS, surgery, inflammatory bowel disease and diabetes may cause an overgrowth of bacteria within the small intestine. This bacterial overgrowth in the small intestine disrupts the normal digestion and absorption processes, and frequently causes inflammation. However, abdominal pain is not always evident in these cases. Duodenal diverticula: Duodenal diverticula refer to the formation of outpouchings from the walls of the duodenum. Infection and inflammation of these diverticula can cause pain and other acute symptoms. Rupture of such diverticula can lead to very serious complications. Before prescribing any specific treatment for a case of duodenal pain, a doctor will usually carry out additional investigations to identify the cause of the pain. The diagnostic tests may include endoscopy of the upper gastrointestinal tract, abdominal ultrasound, X-ray of the small intestine, blood tests and stool tests. Medications to treat duodenal pain may include antibiotics, bismuth-based drugs, and gastric acid suppressing drugs. In case of duodenal pain caused by cancer, therapy may involve surgery, chemotherapy and radiation therapy. Apart from medications and surgery, changes in daily diet are also considered to manage the condition better. The dietary changes are the same as in the case of duodenitis described previously.